Maruti has launched the CNG fuel option of the WagonR. Available only in the base variants, the LXI CNG has been priced at Rs 4.84 lakh, whereas the LXI (O) CNG costs Rs 4.89 lakh (both prices, ex-showroom Delhi). 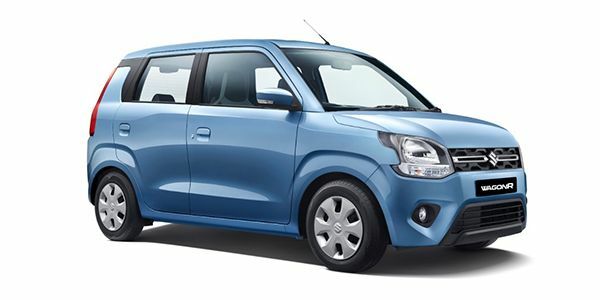 The CNG option is only available with the 1.0-litre engine option which has been carried over from the older WagonR and comes mated to a 5-speed manual transmission. The standard petrol variants start from Rs 4.19 lakh (ex-showroom, Delhi). Prices for the car range upto Rs 5.69 lakh for the 1.2-litre ZXI AMT. Based on the new Heartect platform, the WagonR is now bigger in all dimensions and hence offers more space and better road presence as well. The major update, though, has been made under the hood, with the WagonR now coming with two engine options: the older 1.0-litre and a bigger 1.2-litre engine which powers bigger cars like the Swift, Dzire, Baleno and the Ignis. Inside the car too, you now get a touchscreen infotainment system, dual airbags, manual AC and steering-mounted controls for audio and calls. Maruti Wagon R prices start at Rs. 4.20 lakh for petrol and goes upto Rs. 5.70 lakh. Maruti Wagon R is available in 14 variants and 6 colours. The claimed ARAI mileage for the Maruti Wagon R petrol is 22 kmpl, and for the Maruti Wagon R cng is 33 km/kg. The WagonR continues to be a sensible practical hatchback. It’s now stronger, more feature loaded, more powerful and safer. Importantly, the prices have not gone up substantially. Q. Is its mileage good from Wagon R or not? Q. Which car is best Wagon R CNG or Hyundai Santro CNG? Even with the generation change, there’s no way you’re mistaking the hatchback for anything else but a WagonR. It’s unabashedly boxy and carries over the same basic formula of tall height and XL-sized windows. There’s some novelty here, though. For instance, Maruti Suzuki has added a small sliver of chrome inside the headlamp for that premium touch. A portion of the C-pillar has been blacked out to give it that floating roof effect. The rear too now features larger tail lamps that extend towards the roof. Sadly, all the bling features we’d want, like daytime running lamps and alloy wheels, are missing. We’re told that alloy wheels will be offered as an accessory at the dealership level. For the first time ever, the WagonR will be offered with a choice of two engine options. First up is the 1.0-litre, three-cylinder engine that makes 68PS of power and 90Nm of torque. The other option is the 1.2-litre, four-cylinder engine that also does duty under the hood of the Swift, Ignis and the Baleno. This engine makes 83PS of power and 113Nm of torque. Notably, both engines will be offered with a manual gearbox as well as an AMT. The Wagon R is also available in a CNG variant as well. This is only available in the LXI and LXI(O) variants with the 1.0-litre engine. Maruti claims a fuel efficiency of 33.45km/kg. The new WagonR 2019 is available in the usual L,V and Z variants. While the 1.0-litre engine will be available in the L and V variants only, the 1.2-litre engine will be offered only in the V and Z variants. If you want an AMT, you will have to choose between the top two variants. The CNG variant is only availabe in the 1.0-litre engine and in the base L trim.